DINE LOCALLY FOR A CHANCE TO WIN $280.00 TO YANKTON EATERIES! This month we're encouraging you to treat yourself and your friends, family and coworkers to a heartwarming cup of coffee or sweet treat from the Chamber member locations below. Watch for a new food challenge with a different feature to be announced for May. 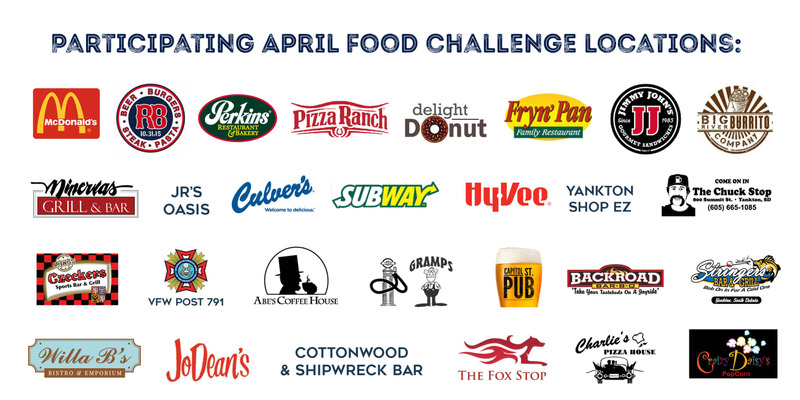 STEP 1: Spend a minimum of $5.00 on ANY FOOD OR COFFEE ITEM at 8 different participating Food Challenge locations between April 1 and April 30, 2019. STEP 2: Save your receipts and submit them for a chance at $280.00 in gift cards to the participating Chamber locations. STEP 3: Submit a Food Challenge form with your receipts for the month of April to the Yankton Chamber by Monday, May 6th at 4:00 pm. - You don't have to purchase coffee or sweets...that's just a suggestion. Spend a minimum of $5.00 on any coffee or food item from appetizers to desserts! - The same receipt cannot be submitted by more than one person. If you dined together and each spent $5.00+, request separate receipts.